Vehicles don’t have to be over the top expensive, coated in flashy paint, with crazy rims and excessive horsepower to be considered cool. Sometimes it’s the rattiest, dirtiest, borderline falling apart cars that get the best reactions. 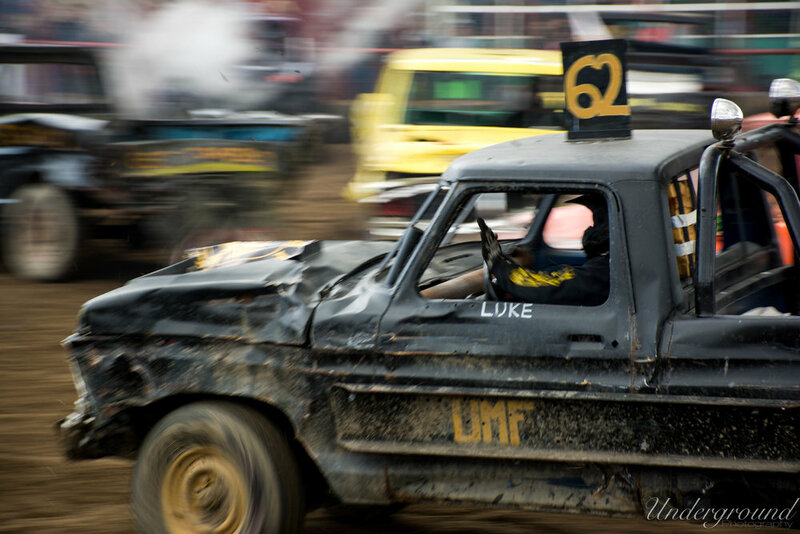 Especially when it comes to a subsection of the obsession everyone knows as the Demolition Derby. There is something seriously rad about messing around and destroying vehicles that were long ago sent to the scrap yard. 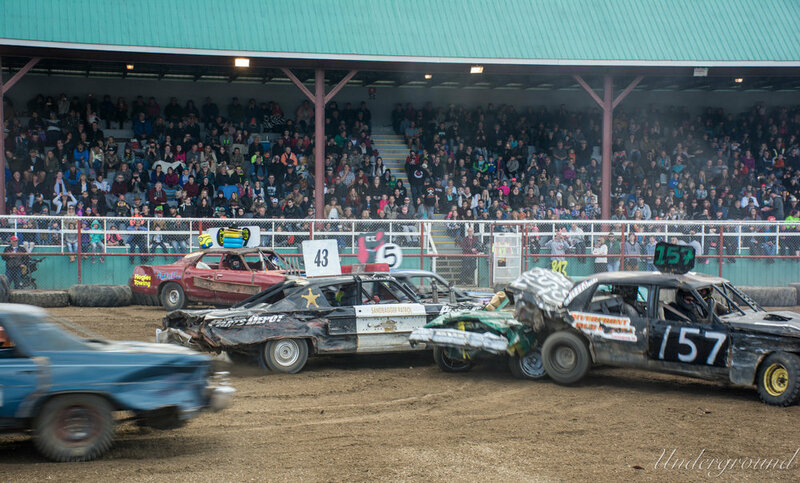 Every year on the Thanksgiving long weekend (In Canada it’s celebrated in October) local shops and gear heads compete to see who has the roughest toughest ride in a series of events that can only be described as hilariously destructive. 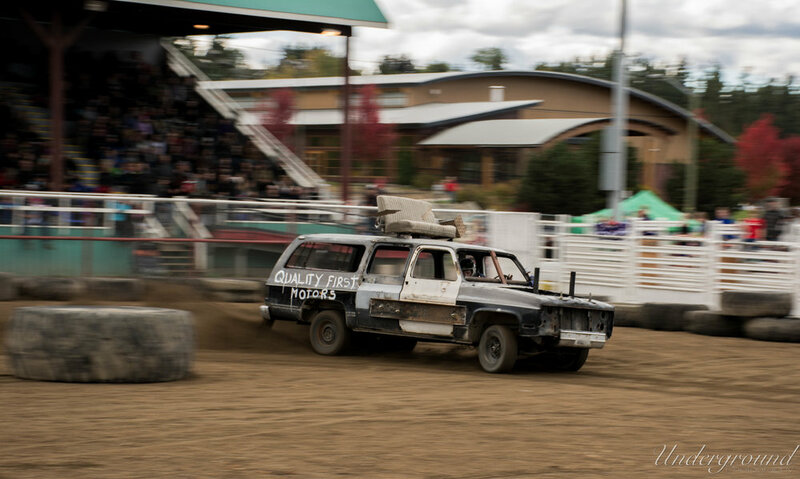 The event draws crowds from all over the province, and drivers bring cars from the junk yards and barns that are spotted all over Beautiful British Columbia. Going to the event was a very last minute decision for us which limited us to the stands, instead of getting a more proper media spot and pit pass, but that didn’t stop us from capturing the four events we went to watch. 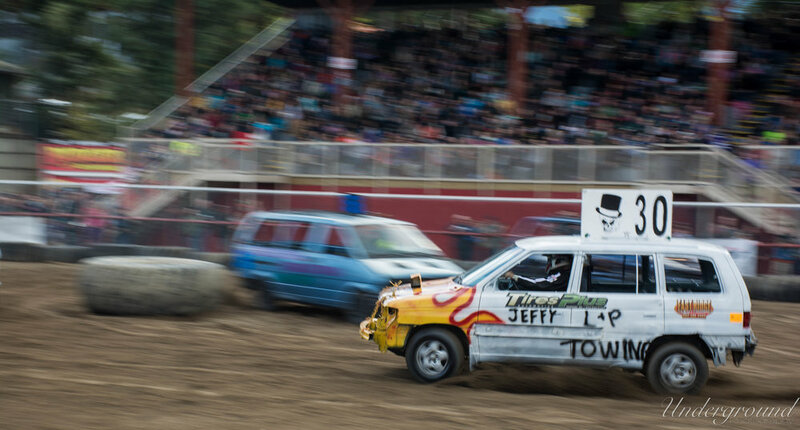 The first thing the crowd had to do was vote for the “best looking” car entered into the derby. 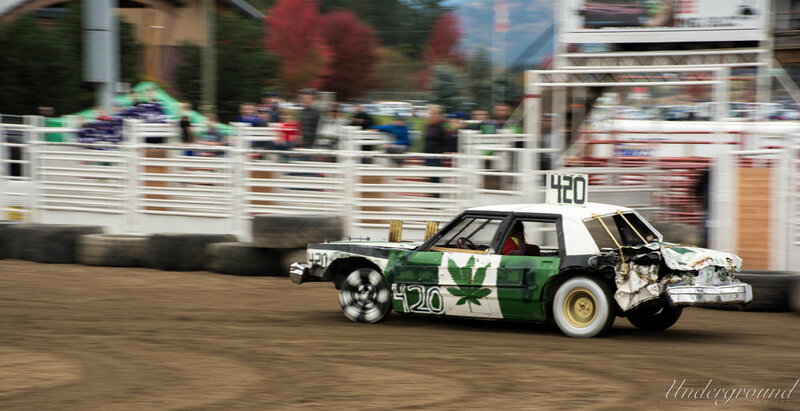 The favorites came down to only two entrants, with car number 420 taking the win for being the best looking of some of the worst looking cars and trucks around. 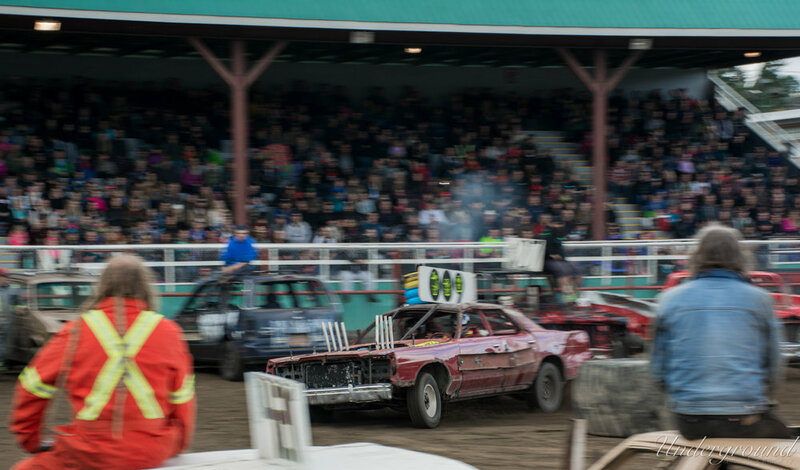 The first actual derby event consisted of the cars. 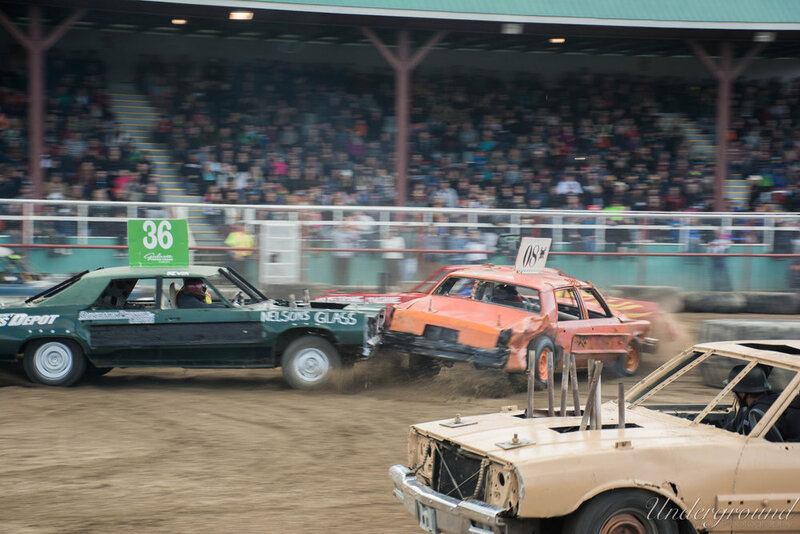 After lining them up head to head in the centre of the arena, the crowd gave them a countdown and literally every open header V8 on the field mashed the gas pedal to push their opponents up against the tires and do as much damage as possible. Trying to explain everything that happened just isn’t possible, but some of the highlights included a snapped wheel hub of the number 43 car leaving the wheel barely hanging on by what looked like a tie rod from where I was sitting. The 199 car smacked into the number 60 car so hard that it kicked the rear end up onto the loader tires directly in front of our spots. 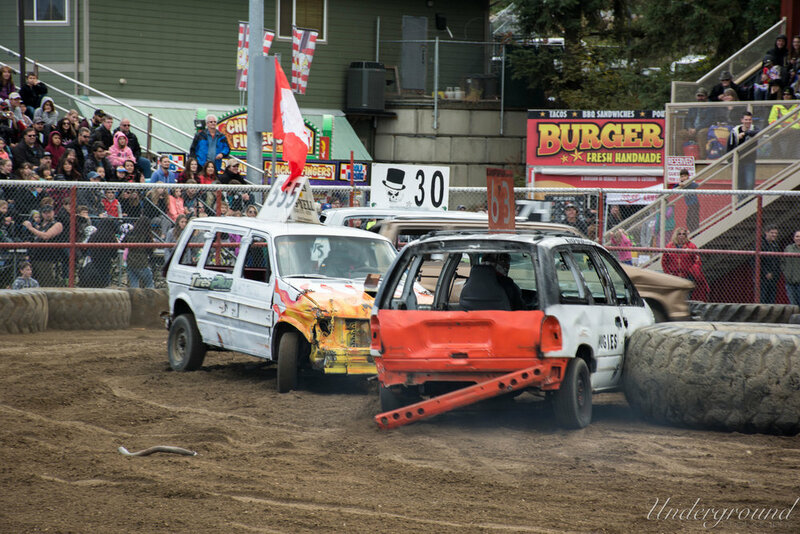 The two cars bumpers connected better than that couple in the Titanic, and refused to let go until the event had ended and a skid steer managed to tear them apart. 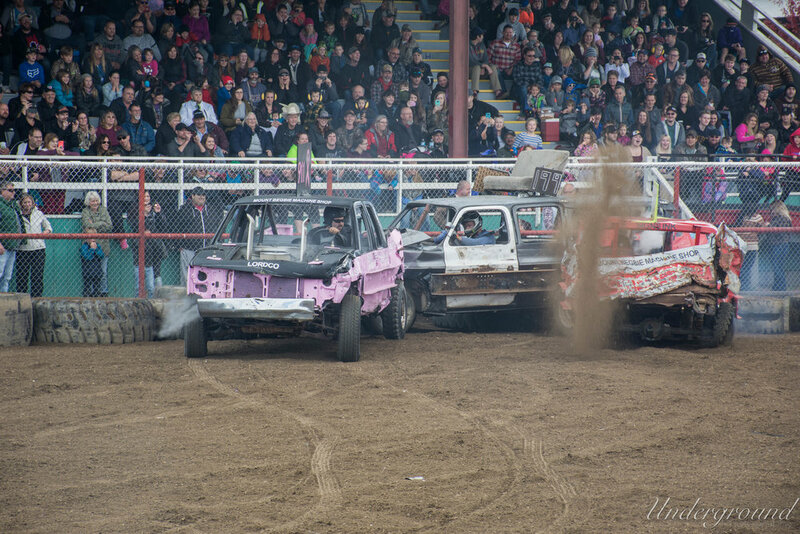 With pretty well every car on the field either smoking, or refusing to move due to completely destroyed parts, the arena was cleared off and readied for the Van figure 8 racing! 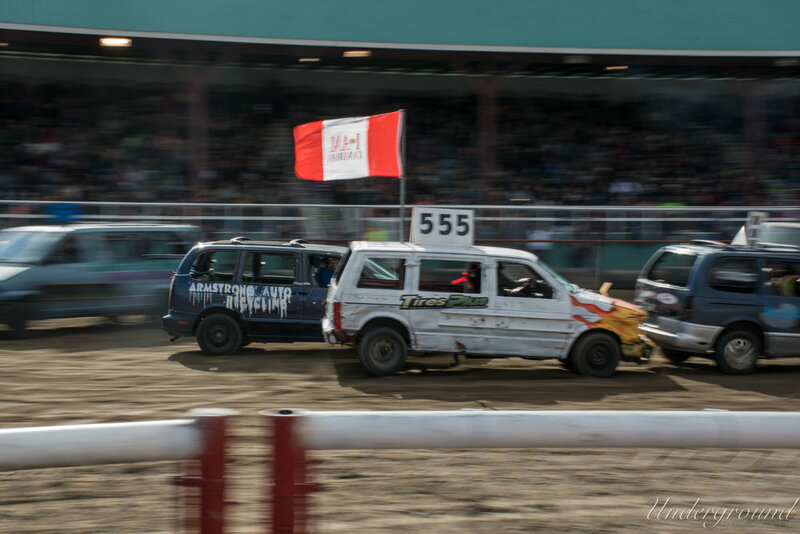 I was hoping to see a little more carnage when it came to the figure 8 racing with the vans, but that doesn’t mean it wasn’t exciting to watch vehicles that were built to carry the kids to soccer practice narrowly avoid each other, at surprisingly high speeds for the size of the track! It started off with a broken rear tire on corner one which paused the event momentarily while the volunteers took care of the debris and brought back the green flag. It was a tight 8 lap race with the number 009 van taking the top spot! 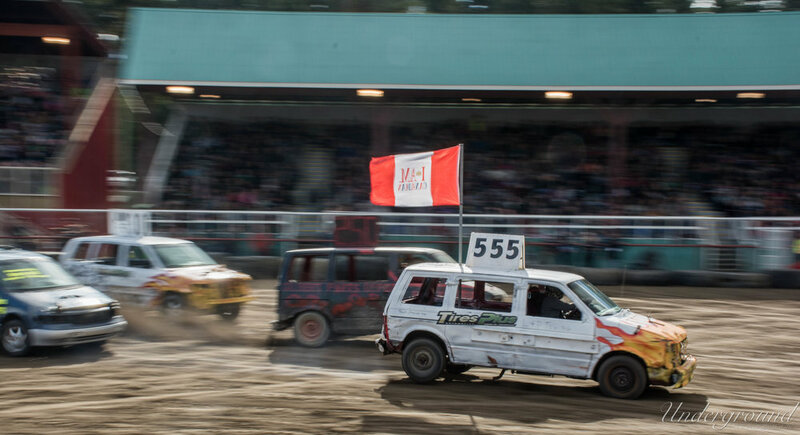 I do have to say I loved the number 555 van sporting a flashy Molson “I am Canadian” flag, found only in 24 cases of beer for Canada day. Class. The next event of the afternoon was my favorite by far. 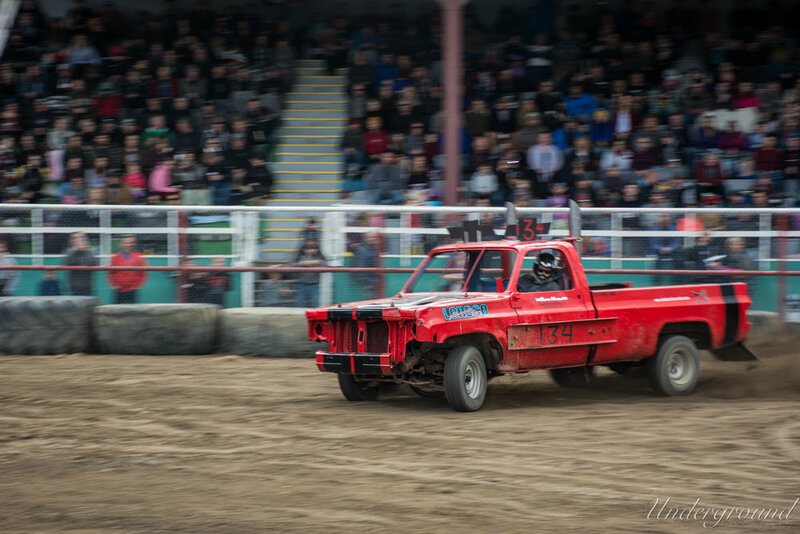 The truck class brought the biggest motors, and heaviest hitters into the ring all at once. This was the longest event we were there to watch, and the most exciting. Pre staged back to back in the centre it started off with high octane battles to see which V8 was throwing the most torque. After the initial back and forth everyone cleared out for some massive head on, and tail end collisions. 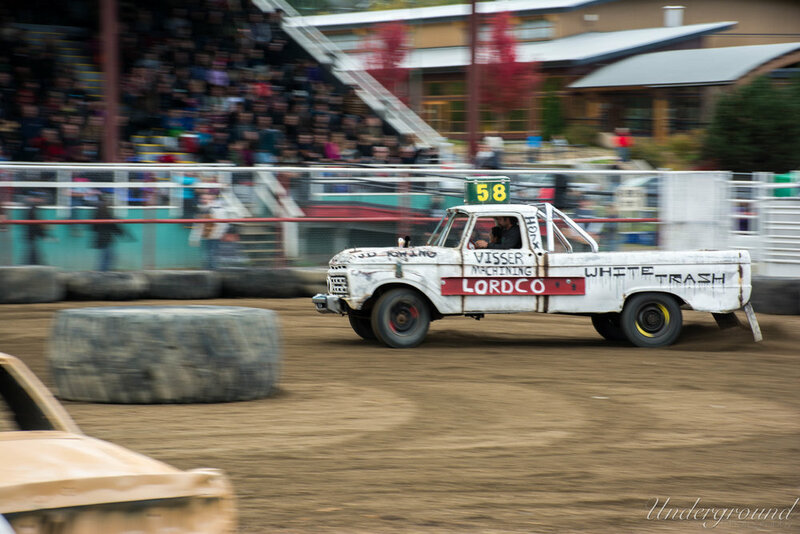 The number 58 Lordco truck deemed “White Trash” was one of my favorites but was disqualified due to a dirty door hit down to the left of me. White trash tossed the already destroyed 152 truck into the tires and nearly took out an official. Not the best way to start off by any means. Either way, nobody was seriously hurt in the collision and it was one of the biggest hits of the day, so I have to appreciate those aspects. The number 811 truck was quite literally falling apart from the beginning and somehow managed to be one of the last trucks running with what looked like a snapped frame from where I was sitting. 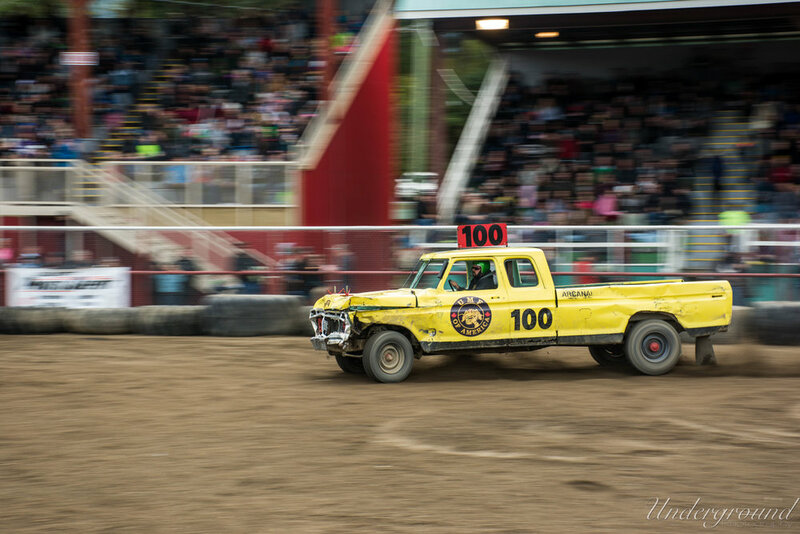 Watching it limp around the track until the drive shaft finally gave out and trapped him in the corner, leaving the 199 truck stuck in the tires across the arena from where I was sitting. 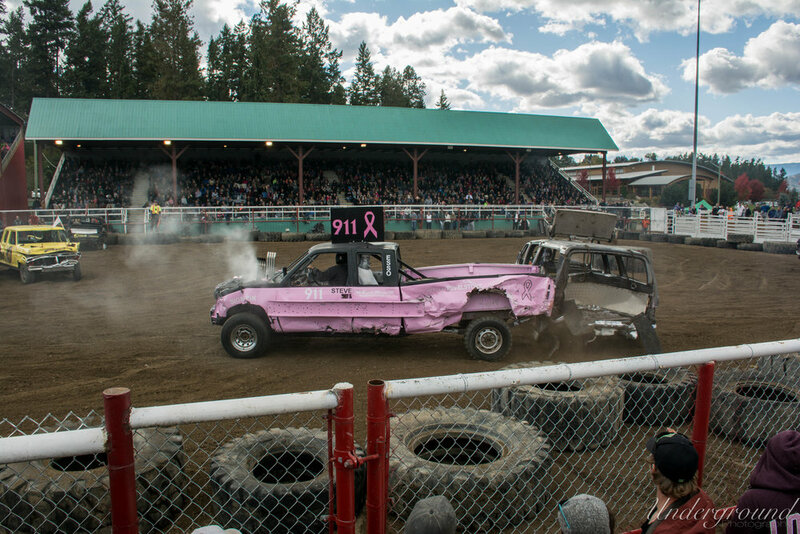 In the end the last truck standing was the Pink 911 Ford which dominated as far as rear end collision go, throwing serious speed and wicked weight into all angles of his opponents to take the win. 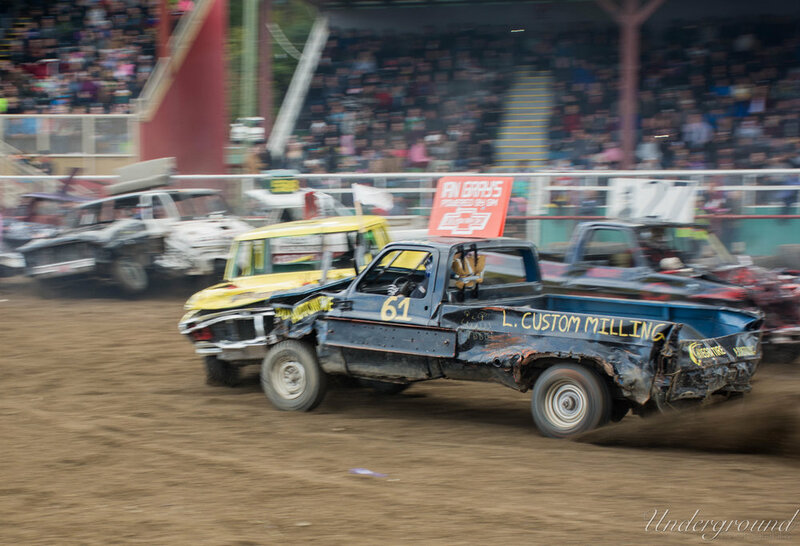 The final race was entertaining to watch, but only had three vehicles entered so it was a very short, and quite clean race, with the biggest collisions occurring against the tires marking the figure 8. 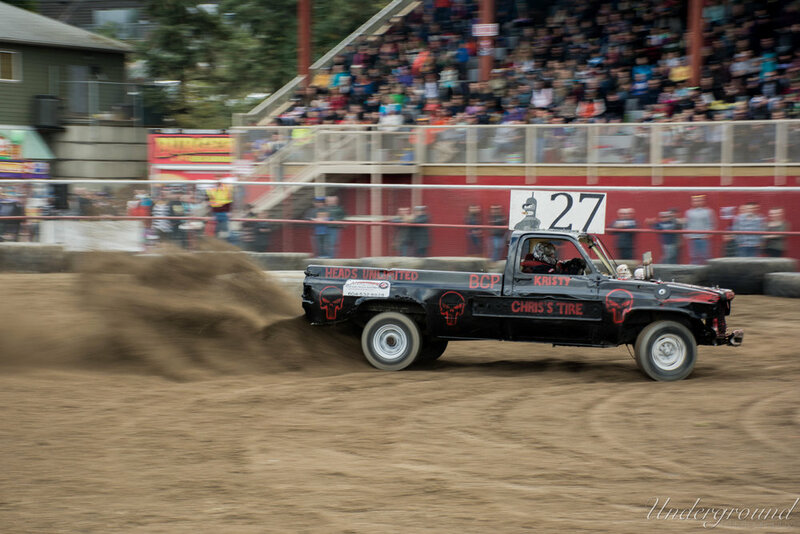 This event was a little different than the vans being that the drivers were all blindfolded, and had to rely on only their co drivers for directions for 8 laps in a classic figure 8. These were the mini cars, which was probably a nice break for everyone's ears as they didn’t put up nearly as many decibels as the previous classes. 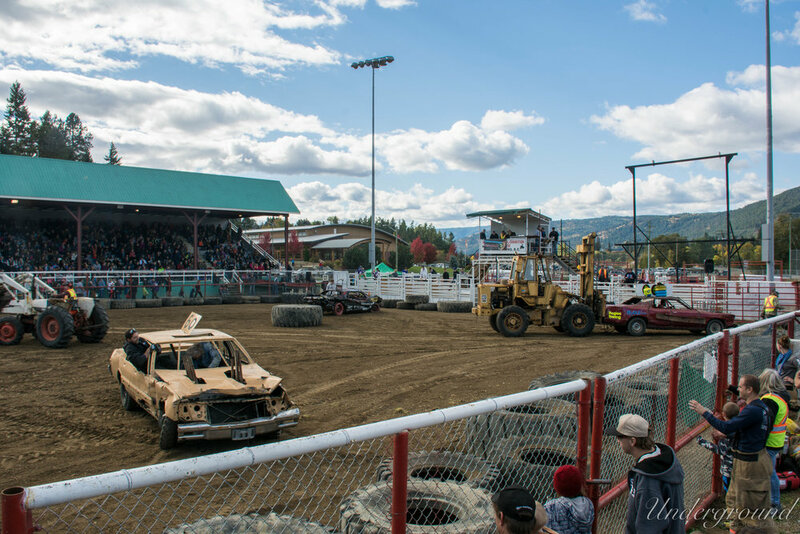 The 303 Honda Civic took the win in this class, keeping the best lines, and the fastest speeds throughout the event, while the MX-3 had some serious steering issues after a collision with the loader tires in the second corner! I had to take off early to get across the Okanagan for another commitment, but what a way to spend the morning and afternoon on a long weekend. Being that it was thanksgiving, the destruction is labeled a family event, and it’s easy to see why when you look backwards into the stands. Adults and kids alike were lit up with excitement as the metal mangled in the ring. Crowd involvement, and excellent organization by all the volunteers and event staff made for a flawless, fun filled family event. Definitely something to be thankful for. But it’s turkey time, until the next event! Original Firing Order apparel is now available on our online store for your enjoyment. Check out our online store to see more. Jeep just revealed the all new 2018 Jeep Wrangler, which features a significant number of ascetic changes. Has Jeep strayed too far from the iconic styling queues Wranglers are known for, or is this the best looking Jeep yet? Casual Friday: Motorsports to come. 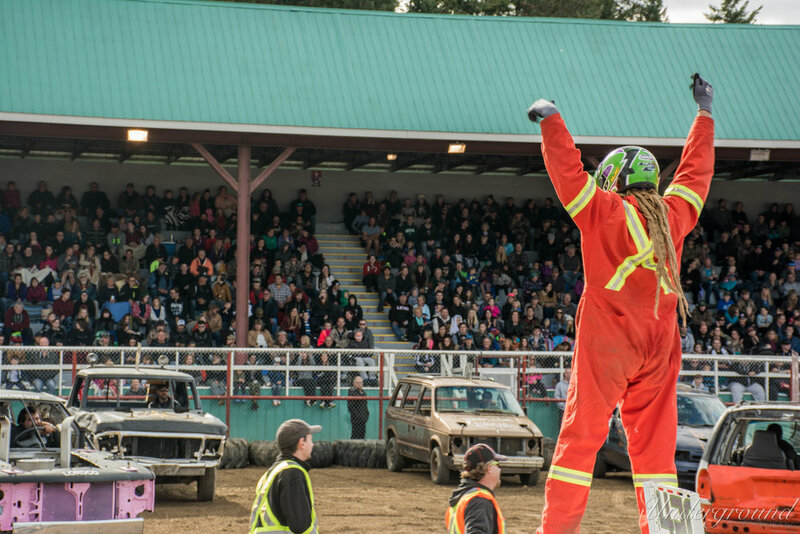 With the off season coming up in western Canada for the automotive enthusiast, we are going to start covering more motorsport stories, starting with the Big White Winter Rally. The videos and photos that come out of the show every year make some people believe they don't need to see this show in person, they can just sit back and watch it unfold on social media. But until you actually have the opportunity to attend its hard to get an accurate scope of just how big this show is. We here at Firing Order had the pleasure of spending Sema week with Austin from World of Oz Media. While we focused on the stills Austin was busy making this awesome video to highlight the craziness that is Sema 2017. Keep up to date on the first two days of the 2017 SEMA Auto Show in sunny Las Vegas Nevada. Mazda has been getting a lot of attention the past few weeks because the rumor mill was talking about a spark less gasoline motor. While that rumor is not completely accurate, it is not far off. Once you’ve fitted aftermarket wheels to your car, you can no longer walk into a tire shop and order tires based on the original manufacturers tire specifications for your vehicle. So, instead of giving the technician at your favorite tire shop a blank look when he asks what size tires you need, read through this article so you can confidently order the perfect tires for your car. When I think of Australian car culture images of old Ford Falcons and Holden Commodores come to mind, the big bodied V8 cars that dominate the V8 Supercars Championship. The Holden Ute, a V8 powered RWD, modern day version of an EL Camino, has made car enthusiasts jealous of our friends down under for years. Little bit longer of a video for you guys today, but it worth seeing the amount of work that went into this '69 Camaro. Roadster Shop out of Mundelein, IL took this '69 Camaro, which looked like it was in decent shape to begin with, from mild to wild with this futuristic restomod. This project is powered by a 680hp 6.2L LT1 built by Texas Speed & Performance, putting power down through a Tremec T56 Magnum transmission.